Designed for large instruments, or where a significant humidification requirement exits, the type D16b humidifier is the larger sibling to the popular D12a machine. 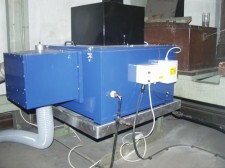 It is currently the largest capacity organ humidifier we manufacture. Sharing the same humidification principle of cold sump evaporation, D16 humidifiers can be found at many prestigious sites around the country. 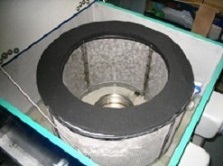 The type D16b humidifier is available in a number of forms to cover most applications. Units can be manufactured in the “classic” style for direct replacement of earlier units that feature the “diaphragm diverter” discharge box, or, with multiple outlets to connect to several points around an instrument. As standard all units are equipped with a low water level switch to prevent operation should there be insufficient water within the unit. Where access to drainage is limited, the optional overflow prevention system can be fitted which shuts off the water supply in the event of the overflow tray becoming full. Once the tray has been emptied, the system will continue its normal operation. 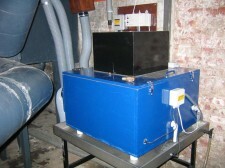 Bespoke options can of course be included to facilitate installation or operation, such as the wall mounted control box shown in the photograph above. Due to the different configurations available please call us to discuss your requirements and for current pricing. We are happy to have our engineers carry out site surveys where installation is required. To demonstrate the confidence we have in our humidification units, from 1st October 2014, we are further extending the full parts and labour warranty on our humidifiers from 36 to 48 months. T&C’s apply. We regret that, due to product liability insurance restrictions, we are no longer able to supply to North America or Canada.